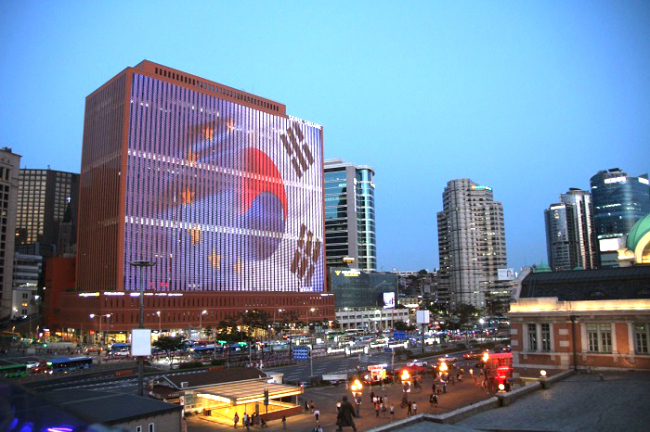 Until Tuesday, the facade of the Seoul Square building is being illuminated in the evening with images celebrating 55 years of diplomatic relations between the European Union and Korea. The anniversary is being celebrated under the theme of “connectivity” between European and Asian economies. Connectivity is at the heart of sustainable economic growth in the 21st century, according to the European Union. It refers to physical links between economies in the form of transport, digital and energy linkages, as well as practices, conventions and rules to ensure interoperability across borders. But first and foremost, it is about the exchanges between people through education, research, innovation, culture and tourism. In October, President Moon will travel to Brussels for the Asia Europe Meeting Summit, which will bring together leaders from 53 countries to discuss how to strengthen connectivity between Europe and Asia.